Ombre is everywhere lately and this is my spin on it. 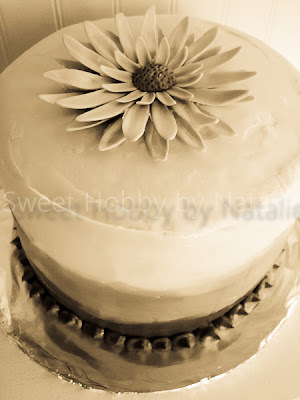 I thought I would just try frosting a cake in an ombre style using lemon flavored butter-cream. 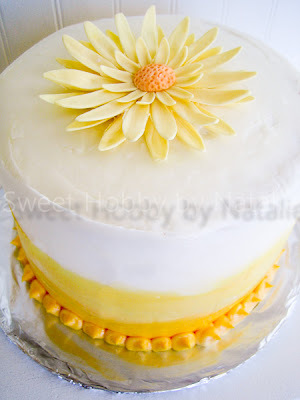 I saw this cake over on Bake at 350's blog and thought I would try out the Lemon-Vanilla Bean Layer Cake. I was not too impressed with the cake, mine turned out very dense but the lemon curd was yummy. Anyway I just crudely piped on the icing in the three different shades from top to bottom and then smoothed it out with a decorating comb/icing smoother, let it crust and then did the VIVA paper towel smoothing technique. I quickly made a Gerber daisy out of gum-paste to top it off. When I was in Light Room exporting my picture I accidentally clicked on a preset filter and I really liked it so I am sharing it as well. It actually shows the three different shades better.